One of my favorite morning rituals is to sit outside in my backyard and drink my coffee while I listen to the birds and start to focus my day. I wait until the kids are off to school. The house is quiet. Breakfast madness is over. There is a calmness. I make my plans to attempt productivity for the day. During the beautiful fall and spring mornings we have here in Scottsdale, Arizona, I love to sip on my mug of hot coffee while I sit out there. During the summer, however, I am forced to drink my coffee indoors. It is just too hard to drink a cup of hot liquid when it is already ninety degrees at eight o’clock in the morning. There is just something not right about it. With temperatures teasing us this week with potential record highs, I have shockingly not been in the mood for a hot cup of coffee. GASP! Because I would quite likely have a headache by noon if I were to fore-go my coffee all together, I decided to try and whip up a caffeine-laced concoction in the blender that would satisfy my java needs. After throwing a little of this and a bit of that into my rocket-motor of a blender, I was shocked at the relatively healthy treat that I came up with. Without trying to, I somehow came up with a morning indulgence that I think I just might be drinking all summer long. And, for the record, I know it is not summer yet. However, with our spring-time temperatures rivaling summer temperatures around much of the rest of the country, it is not too soon to be thinking up ways to stay cool. 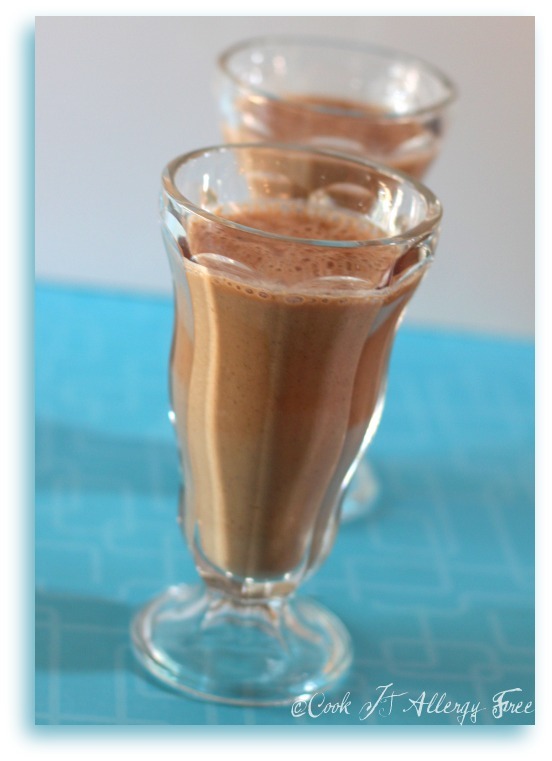 You will be amazed at the frothy creamy flavor that this Mocha”CHIA”no has. And, you guessed it. I even managed to sneak my chia seeds into this one as well (among some other healthy additions). 1. Empty frozen home-made coffee cubes into your high-speed blender. Add remaining ingredients and blend until smooth. Do you have a morning ritual? Tell me what it is. I have been enjoying our warmer weather too- we had a lot of very cold nights this winter. It looks like a lot of people here in North Scottsdale lost a lot of plants, at the very least they wil be stunted for a long time. Shirley, I think this mochachino would be just as good without the coffee. It would be more like a banana mocha. 😉 But, the coffee flavor here is not strong at all. You may just like it!! It is funny how many people I know that do not like coffee. I guess, in my defense, it is Organic and Fair Trade. LOL Have to tell myself something to make myself feel better, right? Jeanine, if you ever make a trip to Scottsdale, i can give you one of these mochachinos, a quiet morning on the deck, and WARM weather!! 😉 Hope it warms up in your neck soon!! Wow I’d love the warm weather. Send it here. I’m not a coffee drinker but this would be really easy to make without the coffee. What a great morning treat this will be! Diane, I just told Shirley that this would probably be really really good without the coffee. Just like a mocha banana smoothie. I just have to change things up sometimes. But my heart still lies with a warm cup of joe. What a great idea to freeze the coffee, now no more waste when I’ve still got half a pot! What an awesome idea to freeze coffee cubes! That does look delicious – and almost makes me want to like coffee … almost! On Sunday, we had to drive from airport in a blizzard. Safe to say, winter has definitely returned where I live! So much for thos nice sunny days, at least for now. I will soak up some Vit D vicariously through you! Alisa, you are yet ANOTHER of my non-coffee loving friends!! How do you all do it? I will one of these days try and find a way to convert you all! And, I had no idea you guys had to drive home from the airport in the blizzard! What a huge bummer!! I hope Tahoe gets hit with some sunny and warm weather soon! YUM! 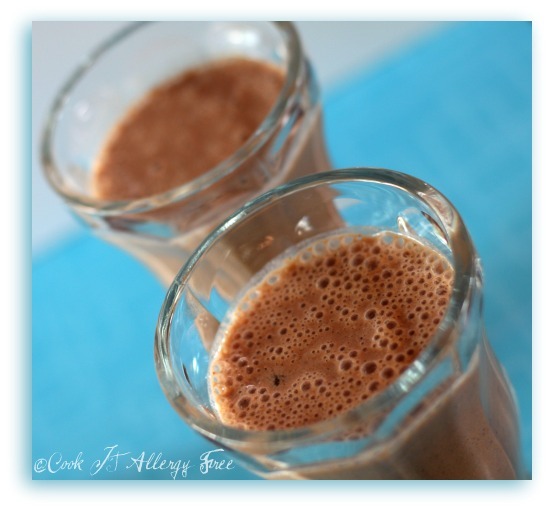 I am going to make this today with So Delicious coconut milk, too! Thanks so much for sharing! I haven’t had a mochacchino in ages! Hi Barbara! I hope you liked the Mochachino! I have made this with coconut milk as well and it is super yummy that way too! Kelly, this would be perfect with decaf! There are a couple of chemical-free swiss water decaf coffees that I will drink if I do not want the caffeine. And I definitely had a few cups of the chem-free decaf when i was pregnant in the winter. I also made this with homemade cashew milk (instead of Almond) this morning and it was SO yummy! Sounds quite yummy. I am so freezing coffee for my summer iced coffees. No more watered down coffee. Wonder where I will be for those warm summers? Hmmmmmmm. Yup, Tia! Freezing those coffee cubes will totally get rid of that watery iced coffee. I am not sure why coffee shops don’t think of that. I can only imagine how much coffee they get rid of each day! That would be the perfect re-cycled solution!! Going to go freeze some coffee right now!